I envy the nighttime streets of Austin and Nashville, lit up with neon signs welcoming visitors into local bars and shops. There’s just something about those colourful beacons that makes us want to head downtown and listen to loud live music and swallow copious amounts of beer and whiskey, and eventually shots of cheap tequila. 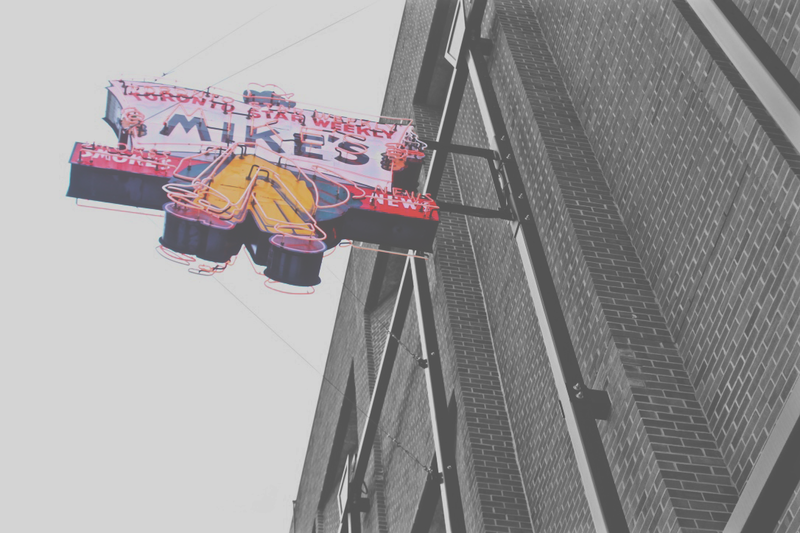 This old Mike's News sign is one of many hanging as part of the Neon Sign Museum. Okay, maybe it’s just me! Whatever the case, one of my favourite public art installations is the Neon Sign Museum on the corner of 104th and 104th, where glowing signage from Edmonton’s past are put out to pasture. When it first went up on February 21, 2014, it was the first of its kind in Canada, made up of a dozen rotating pieces, including Cliff’s Auto Parts, XL Furniture, Mike’s News, W.W. Arcade, and the Pantages Theatre.